Pinto Arch is located off of the Corona Arch trail west of Moab, Utah. The trail to the arch begins near the half mile point of the very popular Corona Arch trail. From there is travels across slickrock and patches of wind blown sand to a secluded area that is the only place from which the modest little arch is visible. 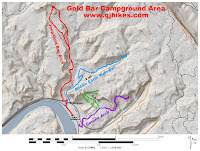 Hikers are also treated with several alcoves with their hanging gardens that include ferns, orchids and columbines as well scenic views of the Colorado River coursing its way through the canyon below. The Corona Arch trailhead is about 14 miles west of Moab. To get there drive north on Highway 191 for about 4 miles from the center of Moab and turn west onto Highway 279, the Potash Road. Follow the Potash Road through the scenic Colorado River corridor for about 10 miles. 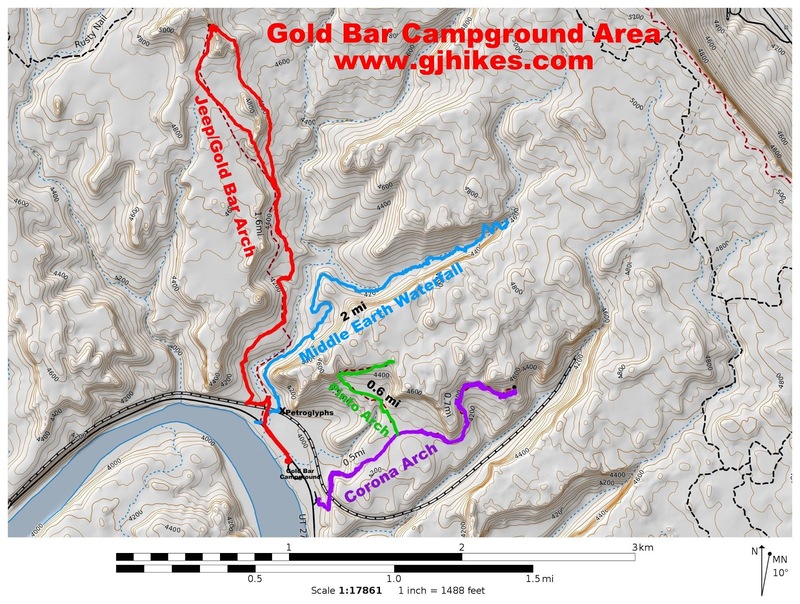 The trailhead will be on the righthand side of the road across from the Gold Bar Campground where there are restrooms. Hike along the Corona Arch trailhead for a half mile and watch for a faint sandy trail that branches off on the left. There isn't a trail sign and the cairn often times gets knocked over. 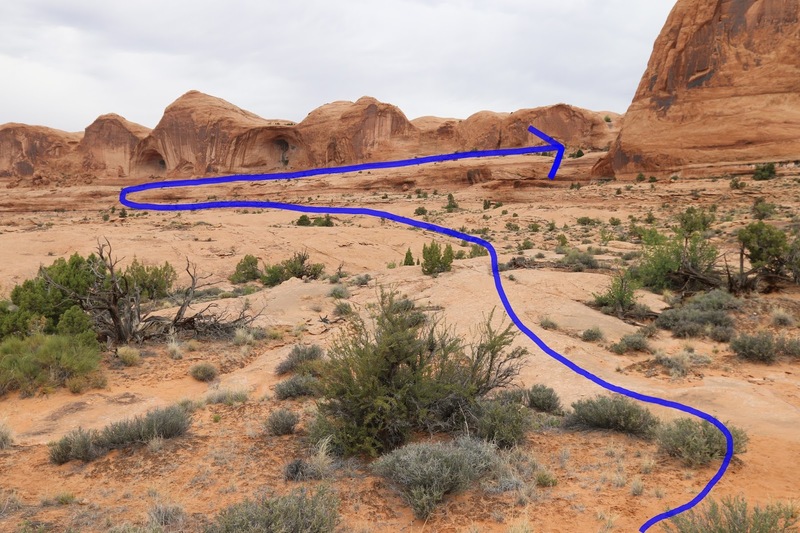 The sandy side trail is the only obvious route that branches off of the Corona Arch trail in this area. The sandy stretch only lasts a short distance before the trail transitions to slickrock. From this point the trial is going to work its way across the slickrock toward several large alcoves. As it nears the alcoves the trail will make a short climb to get up to the bench below them. Then it will travel along the bench for several hundred yards to get to Pinto Arch. There are a few cairns that mark a route across the slickrock. If all else fails all you have to do is hike toward the alcoves along the lower bench until you get to a good spot to climb higher. The easiest spot to get up is marked by a large cairn and involves only minor scrambling. Once on the bench below the alcoves it is a simple matter to hike back around the base of the cliff until Pinto Arch comes into view and the rest of the route becomes evident. After rounding the point of the cliff the arch finally reveals itself. The attractive little arch hovers over an alcove where it opens up to a depression in the cliff above that was probably a giant pothole at one time. The arch looks totally different when standing directly below it. Water seeping from the sandrock in the alcoves and several other spots leading up to them provides moisture for a variety of plants and wildflowers like this stream orchid. 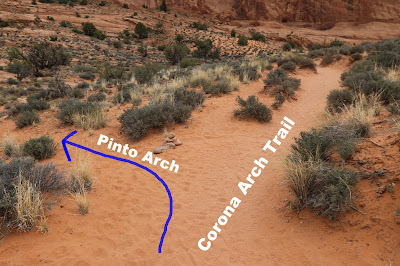 This is another look at the point where the Pinto Arch trail branches off from the Corona Arch trail. Hiking over to Pinto Arch will add about 45 minutes or so to the Corona Arch hike if you happen to be doing both of them together and depending on how much time you spend lollygagging around. Pinto Arch is nice enough that it is well worth the time whether or not it is your primary destination. If you would like to see it for yourself then all you have to do is 'Take a hike'.